It’s that tricky time when New Year’s fitness resolutions start to waver. But if you’re already making excuses about hitting the gym or heading out for those early morning power jogs, you’re not alone­­—especially if you point your shiny new running shoes towards the Richmond Olympic parkrun instead. The 5km Richmond Olympic parkrun is a weekly communal fitness event for all abilities. Starting at 9:00am every Saturday and winding alongside the scenic Fraser River, the timed event isn’t a race—you can run, jog or even walk the route if you like. But it’s a great opportunity to keep your fitness on track in the company of welcoming, like-minded participants. And if you’re an out-of-town traveller trying to maintain your fitness regime while you’re on the road, this is also an excellent way to do it—in fact, the latest Richmond event had participants from the UK and South Africa. Best of all, the city’s weekly parkruns are entirely free to join. All you need to do is pre-register once and then you can turn up as often as you like (just bring along a printed copy of your barcode, so that you’ll receive a time). And although you’re not overtly competing with your fellow runners, since the event is timed you can keep tabs on your own progress and chisel away at your personal best. The parkrun movement started in the UK town of Teddington in 2004. It has since spread to around 20 countries, arriving in Canada in 2016. There are currently regular parkrun events at 21 locations throughout the country, with thousands of runners typically participating every week. Where does the Richmond parkrun go? 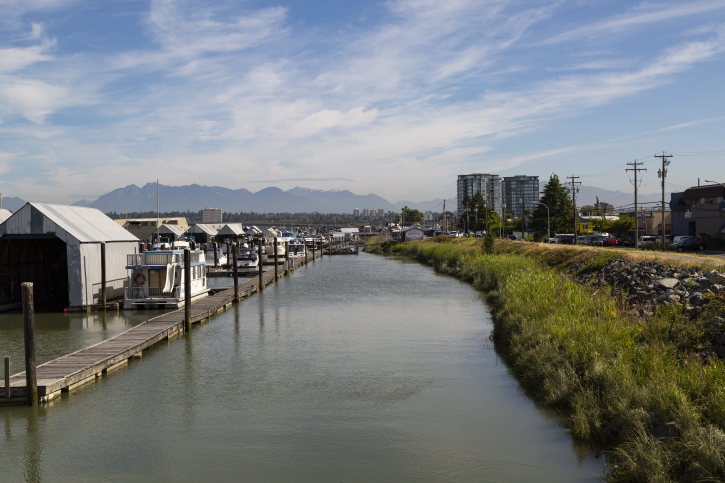 It starts on the riverside path near the intersection of Cambie Street and River Road and then follows the pathway along the Fraser River in a southwest direction for 2.5km. At the designated halfway mark (near Lynas Lane), runners turn around and return to the starting point. It’s a flat route on a paved and gravel pathway. The route is not closed, though, which means runners need to be cognisant of walkers or cyclists sharing the path. But there are parkrun signs and/or volunteer marshals along the course to keep you on track (note: they’re always looking for extra volunteers if you know someone who would like to help out). As a first timer, what do I need to know? All newbies are welcome! You don’t need any prior running experience but you should be fit enough to walk, jog or run 5km. Plan ahead and dress for the weather and the run, preferably in layers. And arrive with enough time to stretch and warm-up prior to the 9:00am start. You can bring your dog to run alongside you (short leash or harness recommended). And you are even welcome to bring a buggy/stroller to push in front of you—it’s best to start at the back of the field if you’re doing this, and to keep to one side during the run. There is limited parking near the event’s Cambie Street and River Road starting point. The best way to arrive is via transit: the Aberdeen Canada Line Station is a 250-metre walk away and the stroll is a good way to help warm up your muscles a little before you start. It can be hard to stick to fitness plans, especially if you’re going it alone or you’re travelling away from home. Joining Richmond’s parkrun gives you the support of a friendly and welcoming group. And since it’s a weekly event, you’ll have an added incentive to stay on track. Did we mention friendly? At the end of every Richmond Olympic parkrun, participants are invited to gather for a well-earned coffee at a local Tim Hortons. Just make sure you don’t eat too many celebratory doughnuts after all those calories you’ve successfully burned off. The Richmond Olympic parkrun is open to all, but you need to register in advance and bring along your printed barcode on the day (phone barcodes are not accepted). You only need to register once and your barcode enables organizers to provide you with an official time for your run. Registration is free and you can complete the process here. Once you are registered, you can turn up to any parkrun event at any time in Richmond or around the world.